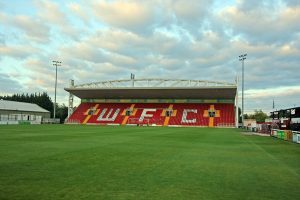 THE transformation of Woking FC’s Kingfield Stadium to English Football League standards and the linked building of more than 1,000 new homes has moved a step closer. Last week, Woking Borough Council approved a viability assessment by the developer, GolDev Limited, for a 10,000-seat stadium and nearly 1,000 flats on the site. The David Lloyd Leisure Centre would be moved to land at Egley Road where 55 houses and six flats would be built. The Laithwaite Community Stadium has a capacity of 6,000, including 2,500 seats. The new facility would allow the club to aim for promotion at least up to League One. According to the assessment, the stadium would cost around £10 million, financed by the building of 992 studio and one and two-bedroom flats and 10,000 sq ft of retail space. The council would buy the Egley Road site and expects the cost to be returned by the transfer of the new properties.